An Anchorage judge has ordered the state of Alaska to allow small, temporary political campaign signs on private property near state roadways — an initial result of a legal challenge to the state's ban on outdoor advertising when it comes to political signs near and in view of state roads. The ACLU of Alaska sued in August in response to a summer crackdown on campaign signs by the Alaska Department of Transportation and Public Facilities. State officials had cited a proliferation of signs along state roadways, including some signs that posed safety concerns. An independent expenditure group supporting Republican gubernatorial candidate Mike Dunleavy and Alaska resident Eric Siebels are also plaintiffs in the case. The lawsuit targeted a state law that bars outdoor advertising in the state right-of-way, including on private property 660 feet from the edge of state rights-of-way. The law said signs couldn't be installed or positioned so the message could be read from state roadways — a provision widely ignored during Alaska election seasons. Attorneys for the plaintiffs said the law unconstitutionally restricted political speech on private property. 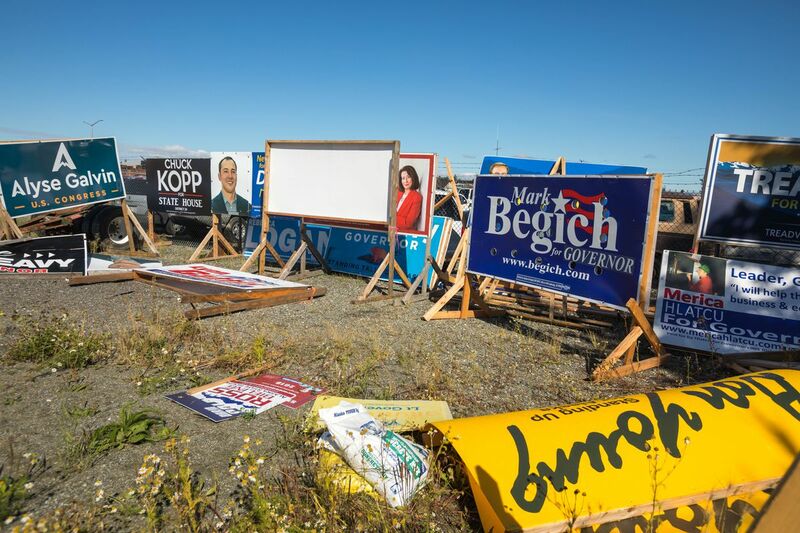 On Monday, Anchorage District Court Judge Herman Walker issued a temporary restraining order that said private property owners in Alaska had a right to place small, temporary political campaign signs on property along state roads. "In particular, the State of Alaska and the Department shall cease threatening the public with fines or fees for displaying small, temporary, campaign signs on private property outside the state's rights-of-way," Walker wrote. The signs can't exceed 4 feet by 8 feet, and the person cannot be paid to place the signs, Walker wrote in the order. He said the signs also can't pose a public safety risk. He ordered the state to publicize the order through its websites, emails to campaigns and in a release to news media. While underlying constitutional questions and other issues have yet to be decided, the plaintiffs celebrated Walker's ruling as a win. "This will increase confidence that individuals can place signs on private property without fines or penalties from the state government," said Terre Gales, the chair of the group Dunleavy for Alaska. Walker's order appeared to be based on a proposal from the state of Alaska in response to the lawsuit, said assistant attorney general Michael Schechter. He said the order would give residents more clarity about where signs can be posted on private property. Schechter had previously argued that there was no evidence DOT had ever removed signs from private property. "I think for the citizens and for the voters of Alaska, this will look very similar to what's been going on," Schechter said Monday after the ruling. In a motion filed Aug. 31, Schechter said the state flagged more than 500 signs in Anchorage, Eagle River and the Mat-Su Valley. A total of 39 were removed, including some with immediate safety concerns, his filing said. He wrote that none of the flagged signs were located on private property outside the state right-of-way. Schechter also suggested a broader injunction sought by the plaintiffs would open up property along state highways to billboards and other forms of paid advertising, which was outlawed by voters in a 1998 ballot initiative. He also said such a ruling could threaten the state's federal highway funding. Peter Scully, an attorney for the plaintiffs, argued in court that even if signs were not being removed from private property, the prospect of fines and legal action was having a "chilling" effect on unpaid political speech. He said the plaintiffs weren't seeking to overturn laws against commercial advertising or permit signs that are public safety hazards. He said a key goal was to "stop disparate treatment of campaign signs" from other types of advertising. Within the state right-of-way, Scully said signs should be treated like abandoned vehicles or other encroachments that aren't posing a public safety risk, where the state is required to provide 30 days' notice before removal. During the court hearing, Walker asked pointed questions of both sides. He asked Scully, the private attorney, if there was any evidence of signs being removed from private property, and questioned Schechter, the state attorney, about whether a law was constitutional simply because voters approved it. Walker indicated in his order Monday he would soon issue a separate order on other issues in the case.